Disclosure: I received the following products for review from Dexas. All opinions are my own. When Hubs and I were dating, he used to always order a salad and I would order a large entree. It was funny seeing the stares of the people sitting next to us or even our friends when we went out together. He wasn't on a diet but truly enjoyed salads. We've gotten bagged salads once in a while but I thought it would be a nice surprise to treat him to a nice salad at home and Dexas makes it so much easier to prepare with their kitchen products. Even when lettuce says it has been washed and/or rinsed, I like to give it another wash at home. My mother-in-law even gave me special bottles of wash for produce/fruit but let's just say that I gave up on that extra step a long time ago. The Turbo Fan Collapsible Salad Spinner is perfect for getting rid of that excess water after rinsing your produce for the salad. Just place everything inside and push to spin! 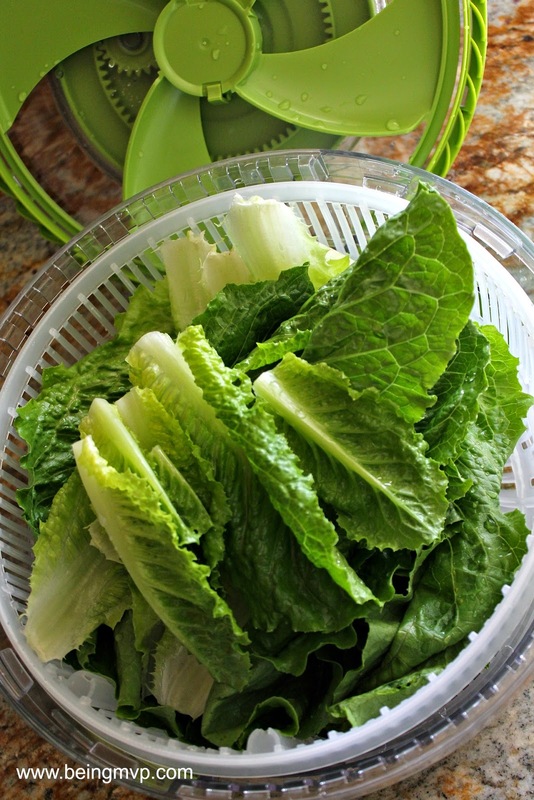 The lid looks like there are fan blades in it and it is very quick to get all the water off of your lettuce! It collapses to a mere 5 inches for convenient storage. After prepping your greens and other salad toppings, place into the 5 qt salad bowl to serve with the spoon and strain serving tongs. The bowl is the perfect size for our family and looks great on the dining table and can go directly into the dishwasher after use. If you don't want to toss your salad with the dressing ahead of time, you can easily fill the KlipKup™ with dressing and clip to the side of your salad bowl. Isn't that pretty neat? A neat must have kitchen gadget from Dexas is the KlipScoop - a 3-in-1 - Food Scoop, Measuring Cup and Bag Clip. You can use it for pretty much anything that needs to be measured from a bag as well as snacks in general. Great for portion control and a plus because it can just collapse and clip your bag closed. Check out the rest of the blog giveaways in the Blog Pop Spring Fling! One Winner will Receive the following Dexas Prize Pack! I'd like the snack duo. And my favorite salad is a Caesar salad. I like the COLLAPSIBLE KITCHEN KLIPSCOOP. My favorite salad is Caesar! I love the 4" Santoku knife with Lemon patterned blade and the collapsible measuring cup. I get a kick out of kitchen gadgets. I love the DOUBLE ELEVATED FEEDER for my doggies! As for salad...I love a good black and bleu salad! I'd like the Popware for Pets collapsible water bowl. A really lemony. oregano-y Greek salad is my favorite! I just love the Collapsible 10" POP Colander. It is always so hard to store a regular colander they take up so much room. My favorite salad is a Cobb Salad with thousand island dressing. I like the 16'' Pizza Board with chrome wire rack and I like a Greek Salad. I also like the PIZZA CUTTER ROLLER. I like Cobb salads. The bowls and utensils look great. My favorite salad is fruit and ceasar salad. I'd love the H-Duo hydration bottle and really like a cranberry spinach salad. I love the 2-Cup Collapsible Measuring Cup. My favorite salad recipe is a southwest salad with greens,black beans roasted corn,chicken,tortilla chips. I love a Strawberry Fields chicken salad (recreated from TGIFridays) and would love to try one of the new Duo bottles. I like the Snack Duos. My favorite salad is a chopped salad. I like the Collapsible 10" POP Colander! 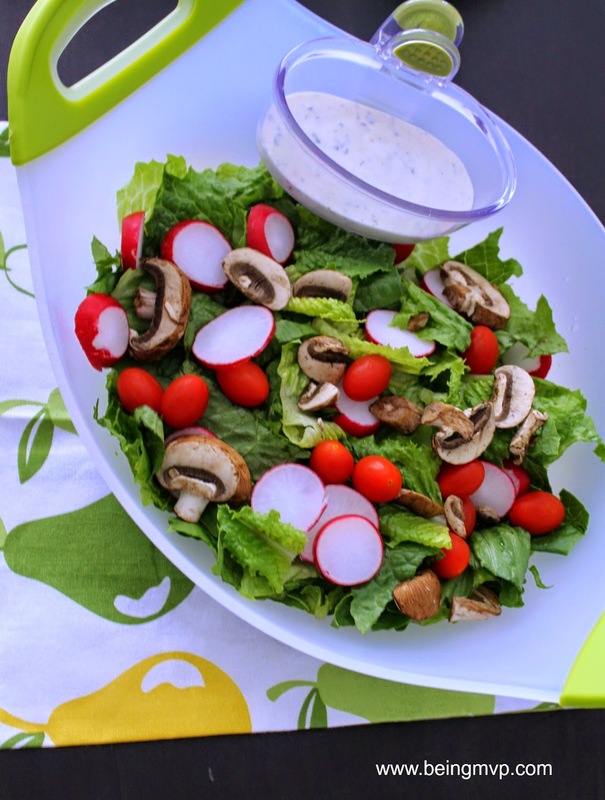 I like a spring greens salad with ranch and lots of toppings! One Dexas product I would get a lot of use from is the Tortilla Warmer. As for my favorite salad, I like mixed greens with veggies like cucumber and onion, served with a creamy herb dressing. I like the H-DuO Dual Hydration Bottle. My favorite salad is Caesars Salad. I LOVE caprese salads, and the snack duo things look awesome! I love caesar salads. SNACK-DUO™ WITH COMPANION CUP looks very cool! I also really like the adjustable pet feeder from Dexas. My favorite salad is a antipasto salad, so delish. I love the collapsible pet dishes they are great to take on hikes or car rides. 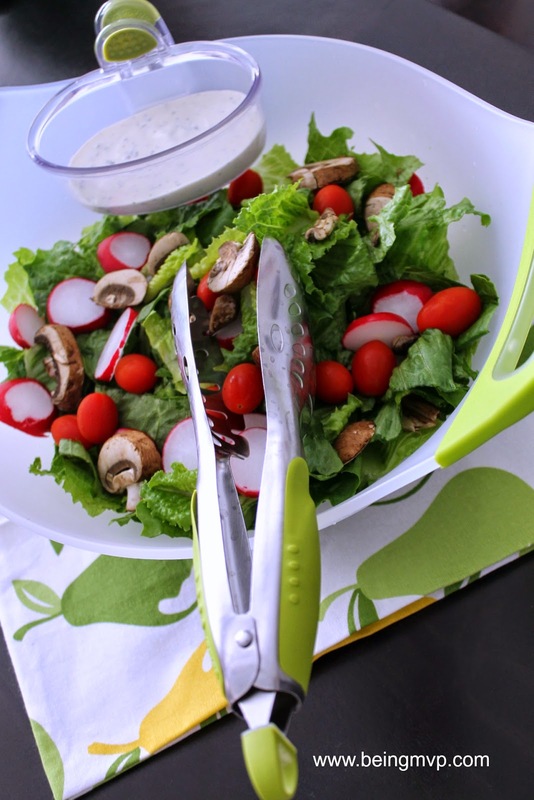 My favorite salad is a chef salad and the lettuce chopper you used looks amazing. I like the 4" Santoku knife with Orange patterned blade and my favorite salad is Caesar salad. I like the double elevated feeder for our cat. I like the 9" Spoon Rest. What fun colors! And I like a tossed green salad with ranch dressing. I would like to have the 2-Cup Collapsible Measuring Cup and my favorite salad is a Cobb Salad! I also like the SNACK-DUO™ WITH COMPANION CUP. My favorite salad is a Ceasar. I would also like to have their Collapsible 10" Pop Colander! I would like to have the two cups collapsable. Measuring cup. The H-Duo looks very handy. My favorite salad is the Garden salad. I would love the SNACK-DUO™ WITH COMPANION CUP! H-DUO™ WITH COMPANION CUP looks like something we would use. I walk the dog a lot and he is a dark color and this would be nice to carry water in. I would also love to have the STORAGE CLIPBOARDS WITH CALCULATOR and my favorite salad is buffalo chicken salad!! I like the 4 in 1 trivet with raised nibs. I like the Cookbook holder. It would be very useful in my kitchen. My favorite salad is chicken ceasar salad. I like the pinch mits. I love greek and chicken ceasar salads. I love taco salads! And would love to have the Melon Art Slicer. I love the DOUBLE ELEVATED FEEDER popware for pets. My favorite salad is Greek Chicken salad. I love the snack duo. It would be awesome for my kids. My favorite salads are chicken caesar and the fuji apple chicken salad from panera. I like the pinch mitt. My favorite salad is one I make out of strawberries and romaine. My favorite salad is Caesar. From Dexas, I also like their collapsible 10" pop colander. My daughter would LOVE the Loomcase Lapcase. I am not a big salad eater, I love a good macaroni salad though! I would also like to have several of the Popware for pets items, like the adjustable pet feeder. My favorite salad is a big steak salad as a main course. The snack duo would be perfect for long car rides, or to even send to work with my husband. I like the Fill-A-Baster and I love a house salad. I really like the LOOM CASE LAPCASE! My favorite salad is the Iceberg wedge! The Snack - Duo seems like a great product and I love salads with blue cheese, cranberries and sunflower seeds! I really like the snack duo, It would be perfect on walks with the kids. I like the snack duo. I pretty much like any salad, with as many veggies and stuff piles on. I like to add sprouts and almonds and other things for fun textures. I like H-DuO™ Dual Hydration Bottle and my favorite salad is romaine lettuce with cranberries and walnuts! I like the Melon Art Slicer and the Watermelon Cutting & Serving Board, this would be nice for the summer. I like the Adjustable Pet Feeder and my favorite salad is a Cobb's salad. I like the collapsible bowl and my favorite salad is baby spinach with apples, cranberries and walnuts! I like the H-Duo Companion Cup for your pets. Looks very convenient and smart. I like the COOKBOOK HOLDER. My favorite salad is the Wonton Happiness Salad. I'd like the Snack Duo, I'd put my fav Caesar Salad in it! I like the two cup collapsible measuring cup. I love chef salads. I would like a Grape Board, and my favorite salad is Cobb Salad. Thanks for the giveaway! Oops forgot to add my fave salad. My fave has no name, it's leafy greens, tomatoes, onions and black olives. I love the 4" Santoku knife with Lemon patterned blade and my favorite salad is Caesar salad. I like the 2-Cup Collapsible Measuring Cup and think it would be perfect for when we are traveling. I'd love the COLLAPSIBLE 10" POP COLANDER, it would save so much space in my cabinet. I love Asian Chicken Salad or Buffalo Chicken Salad. I would also really love the collapsible Travel Cup with bottle holder and carabiner. This would be perfect for my dog, he goes on walks/runs and car rides with me and I always forget his dish. This could just live in my car. I really like salad. I think my favorite is a Maytag Blue Cheese Salad. So yummy. i like the granite grip board and i like greek salad! The EGGPLANT CUTTING & SERVING BOARD is so cute, I love Italian or Greek Salads. I like the 2-Cup Collapsible Measuring Cup. My fave salad is Grilled Chicken. I love all the brightly colored knives! Another Dexas product I would like is the 9" Spoon Rest. My favorite salad is a 7 layer salad. Love the Pinch mitt! I love a walnut apple salad! I love the Hduo water bottles. I love a caesar salad. I also like the Portable C...Feeder for pets,,,would be great to use at home or on trips to the park or any event,,,,My favorite salad is Cobb Salad w.T I D.. I like the collapsible collander, strainer and measuring cup. I also like the Santoku knife with the orange decorated blade. I also love the elevated double pet feeder. There are so many items I like that I couldn't narrow it to just one. My favorite salad is a Greek salad. I like the Adjustable Pet Feeder. My favorite is Apple Pecan Chicken Salad. I would like the Tortilla Warmer. My favorite salad is a Cobb salad. I just love the Pinch-Mitt. I need this! Right now its grilled chicken cesar salad, but I like so many! I love the SNACK-DUO cups! It is the perfect thing for me and for my kiddo's! I love the idea of this combo coming with us on road trips or just to bring to the pool! My favorite salad is a Grilled Chicken Cesar salad! the grape board is really cute. i like taco salads. i also like the Clipulator Clipcase® 1. my favorite salad is a corn and avocado salad my friend makes. I like there h-duo drinking glassies. I like the Over The Sink Contour Grippboard. Thanks! I would like the PIZZA CUTTER ROLLER. I like a taco salad. I also like the pizza cutter roller and pizza cutter rocker blade. I like a garden salad with italian or french dressing. The snack duo is cool. I love all salads....hmm probably fruit salad. I'd also like to have the Lemon Cutting & Serving Board, it's so cute! I like the Pinch Mitt! I'm not sure what my favorite salad is called but I like salads with candied pecans, dried cranberries and blue cheese. I would love to have the Loom Case Lapcase in pink. My favorite salad is a Chef's Salad with amino acids for a dressing. My favorite salads are Chef's and seafood. I would also like to have the H-Duo Bottles. What a great idea to have 2 drinks in one bottle. I would like tortilla warmer. My favorite salad is a garden salad. I like the WATERMELON CUTTING & SERVING BOARD. My favorite salad is ceaser. I like the snack-duo. My favorite salad is a fall salad with apples, candied pecans and a maple balsamic dressing. My favorite salad is spinach, strawberry and bleu cheese. I also really like the Chop and Scoop. I like the 16" Pizza Board. My favorite salad or salads would be Chef or Chicken Caesar. I like the Spoon & Strain Tongs. My favorite salad is a Caesar salad. I would love to have the COLLAPSIBLE 10" POP COLANDER in my kitchen. My favorite salad is Spinach Shrimp Salad. I would love the cookbook holder and i love Caesar salads. I like the snack duo and ceaser salad is my fave salad. I would also like the Granite Grippboard cutting board. My favorite salad is caesar with extra anchovies! I like the Popware™ for Pets stuff, would really be helpful with the cats. Snack Duo companion cup for dogs! awesomesauce! I believe that the over the sink strainer grip board would be great for my home, I could chop up the veggies and put the waste directly into the garbage disposal, my favorite salad is a ice burg wedge salad with thousand island dressing, chopped hard boiled egg, bacon bits and served icy cold. There are so many products I would love to have but like the strainer grip board, the knives and colander. My fav salad is iceburg lettuce, green olives, cheese, ham and croutons with bleu cheese dressing. i like the twin tpet feeder. my salad is usually lettuse, tomato. My favorite salad is usually a house salad with blue cheese! Yum! And I think the See-Through Drawer Knife Block would be a great addition to my kitchen! COLLAPSIBLE TRAVEL CUP WITH CARABINER, we travel a lot and this would be fantastic for our dog. I like the looks of the dual hydration water bottles! My favorite salad is a house salad with cheese and ranch! I like the cookbook holder. My favourite salad is spinach and smoked salmon. I like their extra large ice cube trays. I think they would be great for freezing homemade stock or fresh lemon juice. I'd like the H-DuO™ with Companion Cup for my dog. My favorite salad is a Cobb Salad. Thanks. I'd really love the Collapsible Kitchen Klipscoop, It would be super duper handy for the dog's food! My favorite salad is a nicoise, but I also really love a good cobb or caeser! I want the Double Elevated Feeder! And my favorite salad is a Cobb Salad! Yum! I like the Snack Duo. My favorite salad is a spinach salad with onion dressing. I love the pizza cutter rocker. My favourite salad is mixed greens with grilled chicken, pecans, blue cheese, bacon, croutons, tomatoes, red bell peppers and balsamic vinegrette. I would love to have the 2-Cup Collapsible Measuring Cup. I like to make my own salad with baby spinach, grilled chicken breast, tomatoes, and cheese. I love southwestern salads. I like the melon slicer. I love chef salad with lots of Hidden valley ranch. I would also love to have the cookbook holder. I love the Watermelon cutting board, how pretty! My favorite salad is Grilled Chicken Ceaser Salad. I would like to have the Collapsible 10" POP Colander. Right now I'm loving an Asian salad my Mother fixes. I like the spoon rest, and my favorite salad is Chicken Caesar! I like the collapsible feeding and watering bowls for pets. They'd be great for when we hike/camp with the dogs. The slimcase would be handy when I go grocery shopping to hold my lists and coupons. I love a good old fashioned chef salad. I would love to have the Pinch Mitt, it would be so handy to have in my kitchen. I like a lot fo different things in my salad. I really like the PIZZA CUTTER ROLLER. I like the Collapsible KlipScoop. I like cobb salads. I also love the Slimcover. My favorite type of salad is buffalo chicken salad. I like the 2 Pack XL Cube Ice Tray - would be good for freezing herbs. I like Ceasar salad. I also think the Collapsible 8" POP Strainer looks very useful. My favorite salad is a spinach cranberry salad. 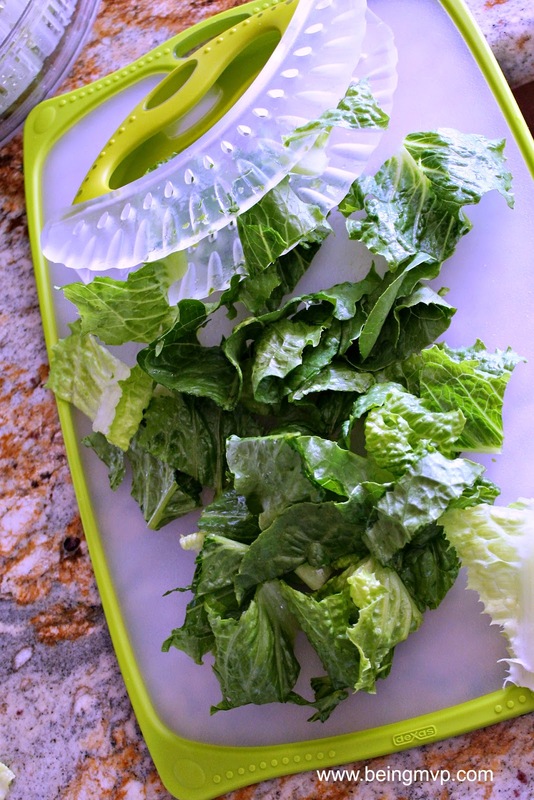 I like the 2-CUP COLLAPSIBLE MEASURING CUP and my favorite salad is Caesar. I would like the Melon Art Slicer. My favorite salad is spinach strawberry. Boston lettuce tossed with chopped bacon, egg, blue cheese, croutons and ranch dressing. at dexas I love the H-DUO™ WITH COMPANION CUP! COLLAPSIBLE KITCHEN KLIPSCOOP and my favorite is the chef salad. I like the Snack Duos and my favorite salad is fruit salad, that counts right? I like the H-DUO™ DUAL HYDRATION BOTTLE and my favorite salad is a strawberry and walnut salad. I love the salad spinner and my favorite salad is chef. I like the 16" Pizza Board w/ Chrome Wire Rack. Thanks for having this nice contest! I would also like to have the Double Elevated Feeder for my dog, Mickey. My favorite salad is a house salad. I would love the 9" Spoon Rest and I love a nice chef's salad! I need some new knives, and the fruit-printed blades are cute! I like a hearty Chef salad with lots of ham, bacon, eggs, and cheese. 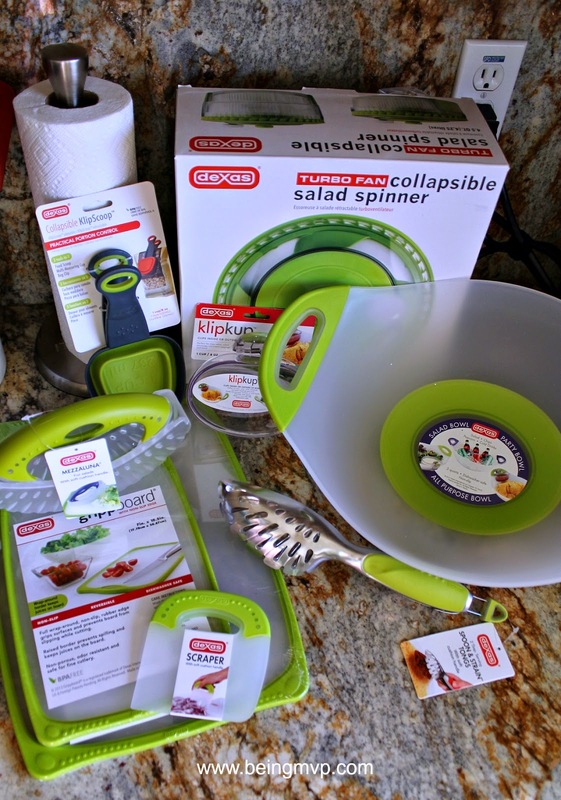 Thank You for the giveaway… we like the Lemon Cutting & Serving Board; favorite salad is a Cobb Salad! I would love to have the melon slicer and my favorite salad is a ceaser salad!